OMAHA, Neb. 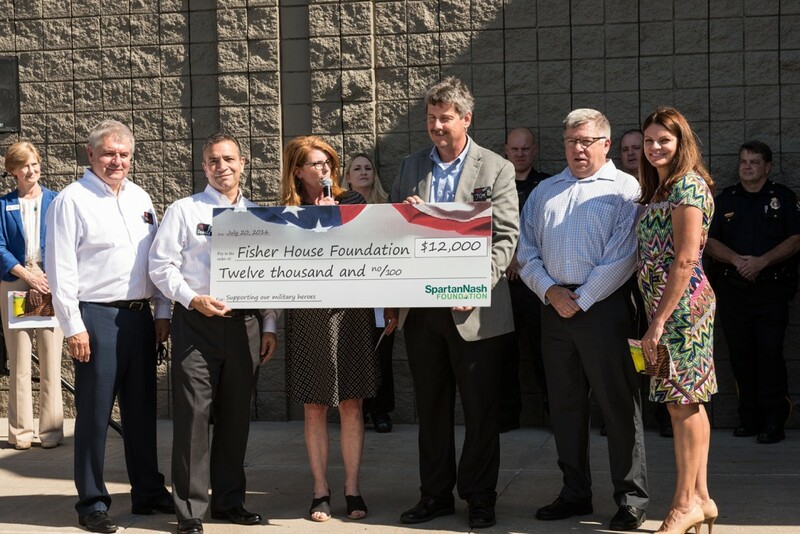 – As a part of SpartanNash’s grand re-opening ceremony for its eight newly renovated and rebranded Family Fare Supermarket locations in the greater Omaha area, the SpartanNash Foundation – the company’s charitable giving arm – recently donated $12,000 to military nonprofit Fisher House Foundation. From June 22 to July 4, each of the more than 30 SpartanNash-owned retail stores and fuel centers in Nebraska and Iowa invited customers to donate $1, $5 or $10 at the register to support military heroes, veterans and those who paid the ultimate price. In total, the scan campaign raised $24,000 in Nebraska and Iowa, which the SpartanNash Foundation evenly split between Fisher House Foundation and its national partner, Honor and Remember. The $12,000 donation from the SpartanNash patriotic scan campaign will help build a Fisher House that serves the VA Nebraska-Western Iowa Health Care System. The Fisher House program provides a “home away from home” for families of patients receiving medical care at major military and VA medical centers. The homes provide temporary free lodging, so families can be close to their loved ones during a medical crisis. “We are very grateful for the support that SpartanNash and their customers have provided,” said Dave Coker, president of Fisher House Foundation. “Without SpartanNash’s support, along with Americans across the country, we could not keep building Fisher Houses, and we look forward to opening the first Fisher House in Nebraska in the near future. Since 2004, the SpartanNash Foundation – and its predecessor the NFC Foundation – has donated more than $155,000 to Fisher House Foundation. From left: Ted Adornato, SpartanNash EVP, retail operations; Dennis Eidson, president and CEO; Meredith Gremel, VP, corporate affairs and communications and executive director of the SpartanNash Foundation; Tom Swanson, VP, retail – west division; Mitch Cadlo, VP, military and national accounts logistics; and Denise Dolan, chief advancement officer for Fisher House Foundation. The patriotic scan campaign was SpartanNash’s first-ever companywide fundraising effort to support military heroes and honor those who lost their lives defending our freedoms. More than 160 SpartanNash-owned retail stores and fuel centers in nine states raised a total of $182,000 during the 13-day campaign, and the dollars are now being granted to SpartanNash’s national partner, Honor and Remember, and three regional partners – Fisher House Foundation, the Disabled Veterans National Foundation and the Blue Star Mothers of America, Inc.
One hundred percent of dollars raised go to the nonprofit partners for patriotic initiatives. SpartanNash, which owns the retail stores, underwrites the cost of the fundraising campaign. Associates and the Foundation contribute financially as well as volunteer their time and talent to the grant recipients.